Revolutionary hotline to work with government ministries, trade experts to ensure businesses do not get bullied for being Israeli. 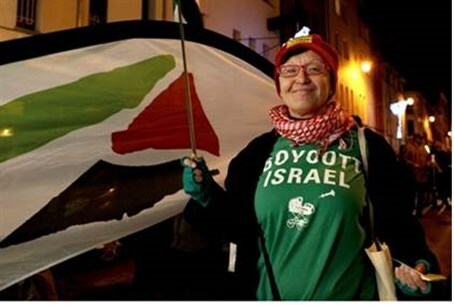 The fight against the Boycott, Divestment, and Sanctions (BDS) movement has extended to the business world, the Presidium of Israel Business Organizations (PIBO) announced Sunday. While great pains have been taken to combat the anti-Israel movement through the media, very few practical options have existed for companies facing open - or silent - boycotts. That will change, however, following the launch of PIBO's special hotline for reports and complaints by business owners about BDS in the boardroom. The hotline will include a panel of lawyers and economic consultants who specialize in international trade - and can handle BDS incidents on a case-by-case basis. "The new line will enable us to provide individual and discreet solutions for Israeli businesses exposed to boycotts and attempted boycotts," Dan Catarivas, Director of the Division of Foreign Trade and International Relations at the Manufacturers' Association of Israel, explained to Globes. "BDS is not a uniform phenomenon; it is expressed differently in each country. When complaints or reports of such cases are received, we will address the situation specifically, using the tools we have, in order to provide them with a relevant and correct response." Catavarias noted that his firm is in touch with three separate Israeli government ministries, and that the panel of experts at the hotline will use "all the tools at our disposal" to combat BDS. "Sometimes a response can use the law of the country, including a petition by us to the local courts in cooperation with our embassies around the world," he noted. The hotline follows a high-profile attempt by Orange, France's prime telecommunications company, to openly boycott Israel in June. Speaking at a conference in Cairo, Orange CEO Stephane Richard said he wished he could dump" Israel "tomorrow" on June 4. A day later the French company announced it had decided to halt its operations in Israel and end its partnership with the Israeli company Partner, which franchises Orange's name in Israel. An investigation revealed that Orange specifically targeted Israel for ridicule, and operated in other "disputed territories" without comment or protest. The faux pas caused an uproar in the media and the Israeli political echelon, for which the company eventually compensated Israel - and Partner - for millions of euros.